2,sublimation printing makes design and virtually unlimited, from simple designs and colors to photographic images and unlimited colors. If you don&rsquo;t have graphic design, you only need to let us know your idea 4,Low minimum orders and size adjustments that will let us fit anyone. Shipping: sample delively time:3-7days bulk order time:10--25days COMPANY PROFILE Guangzhou Joyord Sportswear Co.
3. It&rsquo;s quick dry and features a UPF 50+ rating to block out the sun's harmful rays. 4. It&rsquo;s great for trips to the beach or the pool as well as for lounging around. Company Idea/Vision: Meeting customers&rsquo;requirements with the highest quality and excellent service. OEM / Wholesale / Retail / Drop order Accepted. Welcome! In Stock! If you can not reach our minimum quantity, please contact with our sales to send some models which we have stocks and offer you prices to order directly. 7. Q: How long to deliver the products9 A: The exact delivery date need to according to your style and quantity. Materials: 1. Durable 4 way stretchable lycra; 2. Colorful polyester and nylon spandex lycra fabric; 3. 180-280g/m2 high quality lycra fabric; 4. High quality cotton and nylon stitching threads available in various colors; 5. All components can reach REACH standard. Process: 1. 4 needles flatlock stitching or overlock stitching methods; 2. High quality graphics printing; 3. Customized Logo printed by sublimation or screen printing. Packaging & Shipping Package: 1. 1 pcs packed in a polybag; 2. 100 pcs packed in a standard carton box(45cm x 45cm x 38cm); 3. Shipping mark can be printed as per customer requirements. 1 YRS Dongguan Shark Sporting Goods Co., Ltd.
We can also customize the poly bag and carton with your own design and logo. 3. Q: What &rsquo; s your min order quantity9 A: Our MOQ is 10 pieces and we welcome your sample order. 5. Q: What &rsquo; s your sample policy9 A: The sample fee is refundable. 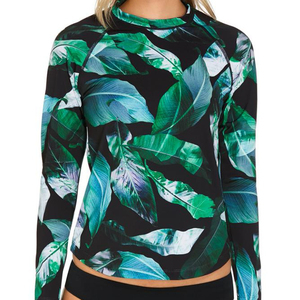 Long sleeve - Rashguard Womens long sleeve stylish Rash guard Swim Shirt With bright colors and perfect, flattering fits made just for surfer girls' bodies, SVS rash guards are beyond hot. But thanks to built-in UPF 50 protection, there's no chance you'll burn. The Whole Hearted long sleeve rash guardincludes logo screens at the chest and sleeve. This short-sleeved protective rush guard is made from special, stretchy material. Flat Lock stitcing(Four Needle, six Thread); 4). Silk screen & Sublimation& Heat Transfer printing ; 6). Q2: Do you have any discount9 - First order over US$5,000 enjoy welcome discount. Please ask our sales person get for it. - Ask our sales person for special discount when you repeat your orders. 2. Main products: bikini, swimsuit, swim shorts, rash guard, cycling wear with padding, fitness wear, etc. 3. With well-trained experienced workers, we produce products in good workmanship and quality. 4. Having multiple fabric&accessories factories allow us to manufacture at different quality according to customer's price level. Garment dye,sublimation also accepted. 6)Size: American and Europe size 7)MOQ: 100pcs. 8)Sample lead time: 5-8days 9)Delivery time: normally 20-30 after approve design and sample 10)Payment: T/T, L/C,western union, paypal, Escrow. 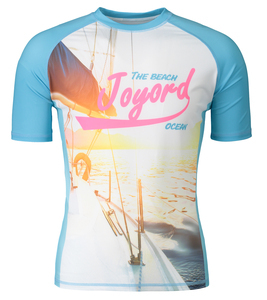 You can choose cut&sew rash guard(logo is screen print) or all sublimatiuon. 2.Limited water absorption makes these guards super quick-drying out of water. 100% percent sure the seam is construction well. 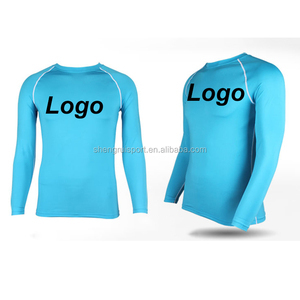 Custom Lycra Shirt Material 80% polyester/nylon 20% spandex Identification SGS report of our raw material. Print Silkcreen, heat transfer, sublimation Workmanship Flat lock stitch MOQ 50PCS Pattern Any designs and sizes are Advantage Price,quality and service. Function Waterproof,Anti-UV50+ Sample lead time 3 days Bulk lead time 15-25 days according to quantity and workmanship of your order. 13 YRS Shaoxing Jonathan Healthcare & Textile Co., Ltd.
we are one-stop factory, from fabric sourcing, print&dye,sample production, mass production, to label, packing. the bigger you place the order, the lower price will be .hope you can understand. 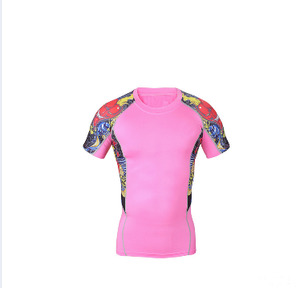 3 YRS Dongguan Top Neoprene Products Co., Ltd.
Lycra T shirt,Lycra shirt, Lycra surf T shirt,Long sleeve lycra T shirt ,Custom rash guard used judo lycra surf t-shirt,Custom lycra surf t-shirt,Sublimation Surf Rash Guard Men's Lycra T shirt,Ladies' Long-Sleeve Performance Fit Crop Top The 7-panel loose fit design of this Lycra shirt features flatlock stitching for maximum durability and Lightweight Lycra shirt dries quickly. 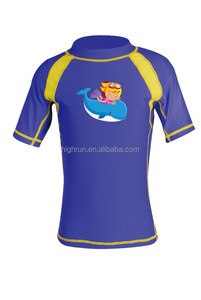 Rash Guard Manufacturer Lycra Surf T-shirt With OEM Logo Sublimation Surf Rash Guard Men's Lycra T shirt Skin tight t shirts for Women / fitness wear/ Rash guard surf Sublimation Surf Rash Guard Women's Lycra T shirt Products Features: *7-panel compression fit shirt *Flatlock stitching *Soft-touch fabric dries quickly *Protects skin against abrasion Detailed information: 1. Material: eco-friendly Lycra 2. Color: Pantone color is available 3. Size: customized 4. Style: designer. 8. Packing: customized 9. Delivery time: 15-25 days after samples and deposit confirmed Why Choose us: 1. Professional OEM manufacturer in the field of neoprene products for years. 1 YRS Dongguan Monkey Clothes Co., Ltd. 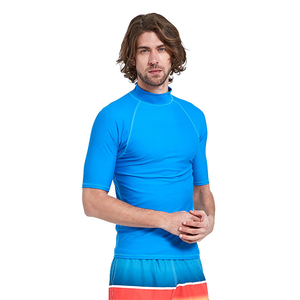 The company is subject in Wetsuit, Dry suit, Rash guard, Mermaid Tail & wetsuit accessories manufacture industry over 1 decade. Exhibition Our Advantages 15 years experience Gantry 5's administrative interface has been Quality guarantee The admin provides multiple options for styles, layout, particles. 24-hour service Salient is built with a responsive layout, which means it automatically. 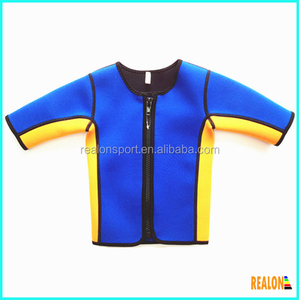 Alibaba.com offers 925 rash vest products. About 43% of these are rash guard, 1% are men's vests & waistcoats, and 1% are reflective safety clothing. 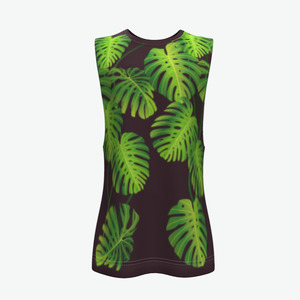 A wide variety of rash vest options are available to you, such as women, unisex, and men. You can also choose from adults, infants & toddlers, and children. As well as from oem service, in-stock items. And whether rash vest is spandex / nylon, polyester / nylon, or neoprene. There are 925 rash vest suppliers, mainly located in Asia. The top supplying country is China (Mainland), which supply 100% of rash vest respectively. Rash vest products are most popular in North America, Western Europe, and Northern Europe. You can ensure product safety by selecting from certified suppliers, including 349 with ISO9001, 149 with Other, and 45 with ISO14001 certification.